(Not my picture.) And it’s a beautiful color. 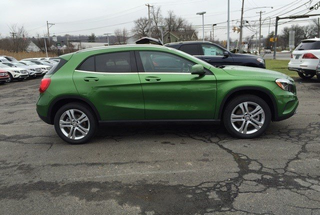 Normally I wouldn’t give a GLA a second look, but this particular color is quite fetching. A grassy medium green always gets my attention, as opposed to darker shades (e.g. forest green or British Racing Green) that almost fade to black under certain conditions - no thanks.